Midwestern Style (mild, sweet, homemade taste). This is Captain Ken’s original chili recipe. It has been a favorite for over 35 years! Hearty chunks of fresh ground beef, fresh cooked kidney beans (not canned), fresh vegetables, mild seasonings, plus just the right amount of brown sugar giving the chili a smooth, slightly sweet flavor. And don’t forget, Firehouse chili is made using only all-natural ingredients with the same spices and ingredients you find easily in your kitchen at home. 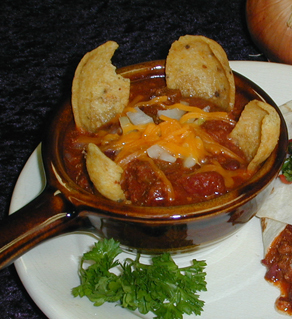 See our Chili Recipe Idea booklet for great tasting and fun ways to use chili in different food dishes. Southern Style (beefy, vegetable flavor, not sweet). This is the Captain’s newest chili recipe. 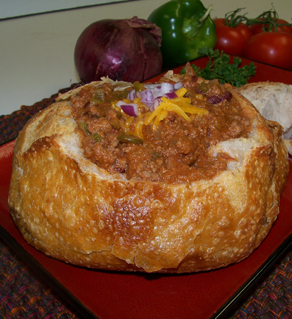 It can be easily distinguished from our famous Original Firehouse Chili. The Wagon Trail recipe is made using the same great tasting fresh ground beef but with extra fresh diced onions, green peppers & celery, plus a blend of spices (no brown sugar) for those wanting a less sweet but zesty tasting chili, resulting in a delicious upfront ground beef and vegetable flavored chili for all to enjoy with the quality customers have grown to expect! 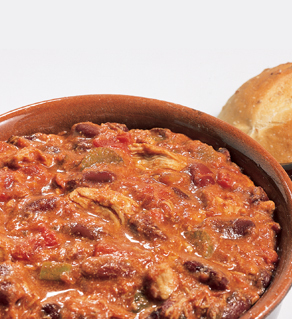 Captain Ken’s CHICKEN CHILI is made with generous portions of tender lean chicken, the highest quality kidney beans, fresh jalapeño peppers and special seasonings that offer a delicious zesty gourmet quality side-dish; not too hot but just the right amount of spice. Serve in a bowl, use as a topping, or just scoop with a chip. Great for resorts, schools, ski lodges, and more. And best of all, it is made with only all-natural ingredients and tastes just like homemade! Great menu addition to complement the Captain’s beef and veggie chilies. 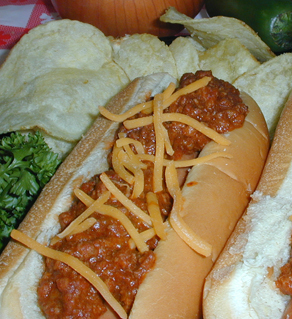 Captain Ken’s CHILI HOT-DOG TOPPING is the best! It’s a thick and hearty sauce that won’t drip off the bun. We use fresh ground beef, celery, onions, tomato paste, jalapenos, fortified textured vegetable protein and special seasonings to provide a savory taste with just the right amount of zest. Like our Sloppy Joe, it has applications for many venues such as convenience stores, delis for the lunch crowd, concession stands at ball parks, race tracks, and amusement parks, and much, much more. You’ll never need or want ketchup again! Try some today. 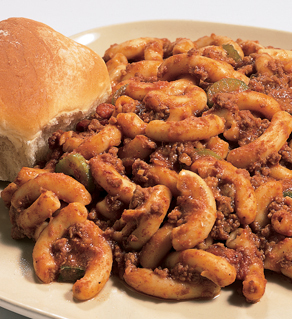 MACARONI & BEEF is another favorite in Captain Ken’s line of hearty comfort food products. It is made with tender elbow macaroni, fresh ground beef, fresh cut vegetables, mild seasonings including jalapeños for just the right amount of zest, all in a rich tomato sauce. This product can be served on the buffet or sold in bulk at the deli. Complement the meal with some nice soft butter dinner rolls and the meal is complete. Kids and adults will all enjoy. Always a treat! Minnesota Prairies’ GRASS FED BEEF CHILI is “Made for the Heartland with ingredients from the Heartland”. The recipe is locally produced by Captain Ken’s Foods in St. Paul, Minnesota. It is made with sustainable agriculture raised grass fed beef from the Upper Midwest and dark red kidney beans from Central Minnesota. Combined with fresh vegetables and mild seasonings, it is Minnesotan, and follows Captain Ken’s tradition of quality, convenience, and value. Minnesota Prairies’ MACARONI & GRASS FED BEEF is “Made for the Heartland with ingredients from the Heartland”. The recipe is locally produced by Captain Ken’s Foods in St. Paul, Minnesota. It is made with sustainable agriculture raised grass fed beef from the Upper Midwest, tender elbow macaroni (also from the Upper Midwest), mild seasonings, fresh cut vegetable with jalapeños for just the right amount of zest, all in a rich tomato sauce. And best of all, it is a comfort food product that can be enjoyed by young and old.